Dalet will unveil the Dalet Galaxy five at NAB 2018. The new version of the media asset management and workflow orchestration platform brings a number of important functional enhancements and three technology innovations that augment media operations and enable new forward-thinking business models. The first enables broadcasters and media organizations to leverage AI across the workflow, the second leverages hybrid infrastructures with on-premises and cloud deployments, the third puts social media at the core of the operations. 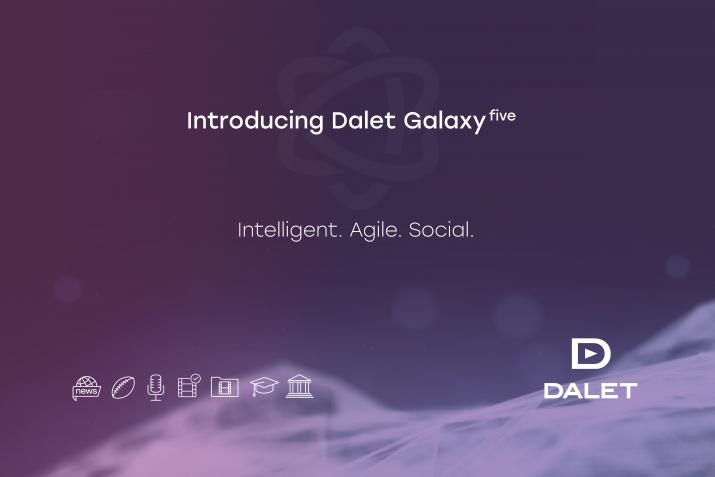 The new Dalet Galaxy five AI framework connects, orchestrates and fine-tunes purpose-driven combinations of AI models, enabling media organizations to build intelligent workflows that assist users with recommendations, facilitate collaboration with smart matching, and use predictive analytics for better provisioning and automated decision-making. “For media operations to get full business value from AI, it requires the right method and the appropriate platform. The new AI framework is designed to orchestrate combinations of cognitive services, fine-tune the models, version the data sets, align them with customers’ taxonomies, and eventually surface the results at various levels of the Dalet application stack to provide actionable insights and real business value to the users and to the organization,” Elnecave says. Dalet Content Discovery, the first application to leverage this new AI framework, will be showcased at NAB 2018. The new module uses data generated by cognitive services, combined with existing metadata, to build smart content recommendations for editorial and creative teams. Deployed as part of the Dalet Unified News Operations and Sports Production solution, Dalet Content Discovery leverages automatic content tagging, topic extraction and key phrase searches, orchestrating a combination of Auto Indexing and Natural Language Processing (NLP) technology. “Dalet is offering a tight and seamless integration with AWS. Two examples, which will be shown on the stand, are the auto-scalability capability to save on infrastructure costs and the native support of S3 and Glacier. The latter provides a seamless user experience; for instance, content served to our web-based and mobile app clients Dalet WebSpace and Dalet On-the-Go respectively can be hosted on and streamed directly from S3,” Elnecave says. The new hybrid capabilities will be illustrated at NAB 2018 with four distinct Dalet Galaxy five workflows – Archive in the Cloud, External Content Review, Multi-Site Federation & Content Sharing, and Disaster Recovery. The new version of the Dalet Workflow Engine included in Dalet Galaxy five offers enhanced task management, high availability and new API services that simplify the integration with third-party systems. Recently added capabilities that will be shown at NAB 2018 include top-down view of group tasks and shared task lists as well as task time tracking and data aggregation for reporting and analysis. “In a traditional workflow you need to re-render your entire project several times throughout its lifecycle including every version you need to distribute. The Dalet Galaxy five data model and toolset allow comprehensive component-based workflows. A much more flexible approach that de-duplicates media and offers significant savings on production time and delivery, both critical for managing complex international versioning workflows,” Elnecave says. Beyond media management, Dalet Galaxy five is a full communication and collaboration platform for connected teams. New collaboration enhancements include Media Bins that provide media sharing flexibility; Dalet On-the-Go brings programs management tools to your phone and tablet; the updated Dalet Chat capabilities allow users to work by thread and embed assets such as graphics, audio and video files to provide a more comprehensive communication stream. Dalet Galaxy five offers a more comprehensive and collaborative editing experience to fit any workflow and editor’s needs. Dalet Webspace features a story-boarder for cut editing anywhere; the Dalet OneCut built-in desktop has more editing tracks, new transitions and effects; the Dalet Xtend integration with Adobe Premiere Pro CC expands to support Adobe Projects as well as the Dalet CG-on-the-Timeline model. The new version of the Dalet Report Center features new set of data extractions and data model that supports analysis and reporting on a new set of business indicators. At NAB 2018, Dalet will illustrate this with some first business reports focused on a typical news operation and its contents.